What I love about the summer is the variety. Before the tricos this morning I found three trout using a double nymph rig — including one nice one — and then had two hours of casting at pods of rising trout. It’s the best way to spend a morning. The solitary risers were very difficult. The trout in groups were more forgiving. They wanted the teeniest trico I had, on 8x. The olive spinners in the evening are a mix of size 24s and size 18s and last night they wanted the 24s. I fished right in front of the restaurant at the lodge, in the Fence Run, and had a great pod of trout working and landed a fine teenaged rainbow and a nearly as fine brown and never saw another angler (though I knew Terry was down on the bench). I’ve had similar reports on both the South Branch and even the North Branch, which has been okay in some spots. 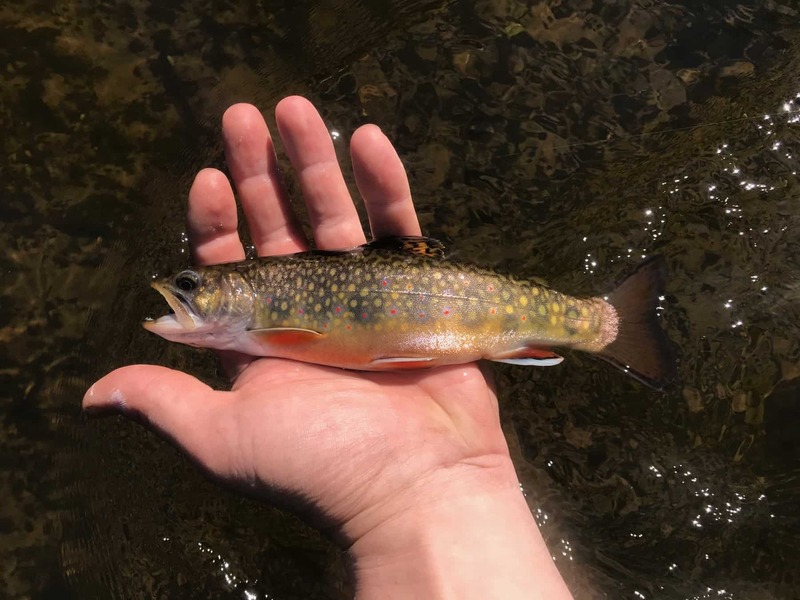 The trout in the Au Sable — maybe because of the heat, maybe because of the low water, maybe because of both — are definitely podded up. If you have a few pods in your beat, you’ll be entertained. If not, the river will look dead. My only advice is to keep walking, and try to find pinch points and riffle water. It’s been a very dry, very cloudless summer. The fishing is sparse and technical during the hatches. 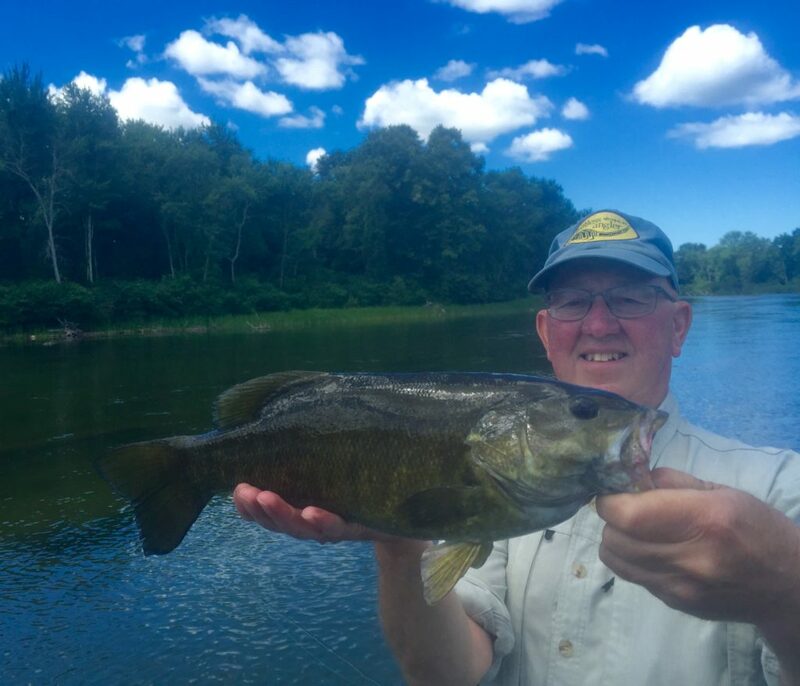 In the middle of the day, you can usually drum up some nice fish hitting the cover with bigger flies…but this is a low percentage game. I’ve done best fishing a 12 or so foot leader with a small dry and an even smaller dropper on 7x fluorocarbon, focusing on the many mid-river shelves. The antidote to this sort of fishing is to go out at night. Low, clear water is to the night fisher what cheese is to a mouse. 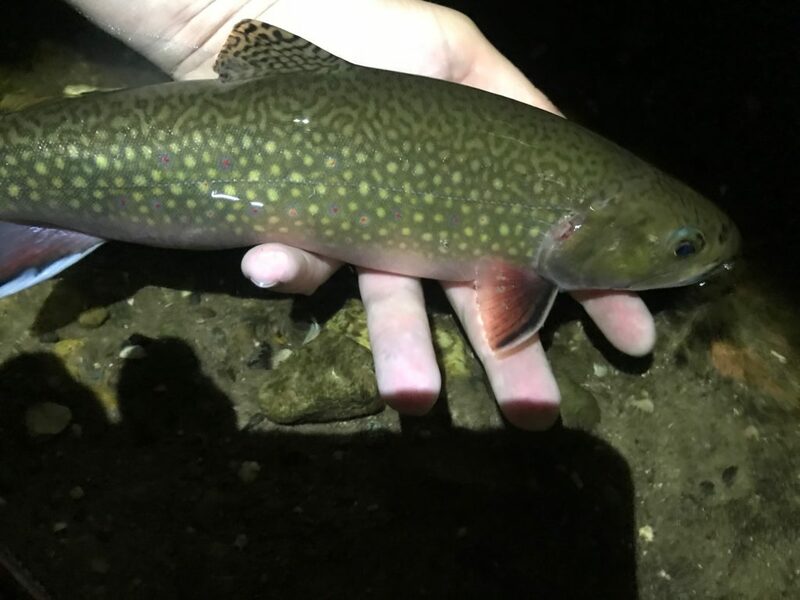 The shop staff has been burning the midnight oil across the county and have landed some pretty grand trout this week. I love when they walk into the shop smiling and bleary-eyed and, after a cup of coffee, I get the story. The moon is a crescent now but it’ll cycle through, and for the night fisher, the next week will be a bit brighter, a bit cooler, and will require more patience, thought, and luck. Downsize the fly (I like small and black) and the tippet, watch your wake and wade quietly. There’s a lot of fun to be had out there, as two anonymous anglers — Soon Tobewet and Soon Tobelaughing — found out a few nights ago. They’d gone to a pretty cool little spot that’s still a secret. It’s a big deep bend pool with an enormous log jam on the outside bank. Well Tobewet reported that a new tree was in there that he didn’t know about, and he snagged it. Being a guide, he didn’t want to just lose the fly, so he waded over, climbed up into the log jam, lay prone, and got his fly. When he turned his light from the fly to the river, he saw a what he described as a “very large snake” swimming right at his face. He panicked, and rolled backwards, into the river, and took on quite a bit of water. The local bass lakes have been have been good for some popper fishing if that’s your thing, and the creek fishing has filled in the gaps. 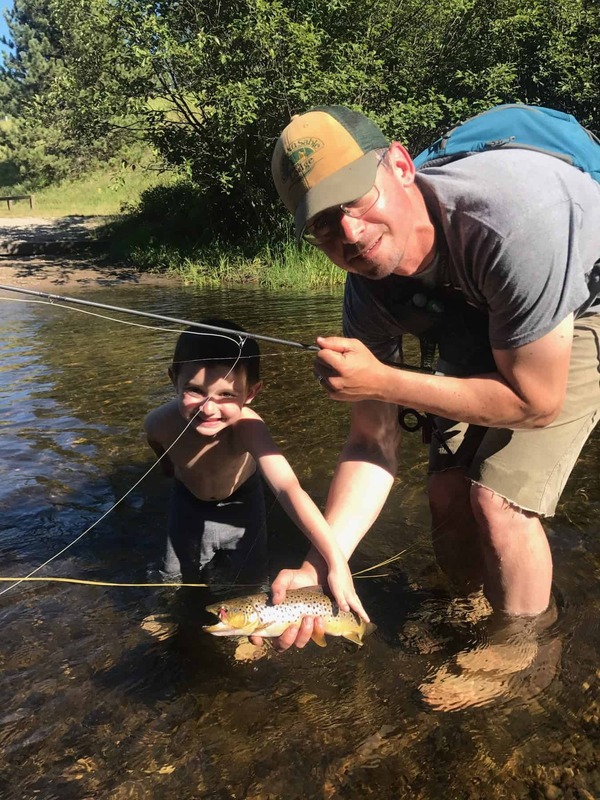 It has been a difficult July up until this point, and while I can’t report that the fishing is great, the needle is pointing in a much better direction at this time this week than it was last week. The Midnight Derby, August 11th: Every year we have ourselves a little midnight party on the banks of the Au Sable. 40 teams, $50 per team. 7 pm – 3 am. Barbecue, music, and fun. 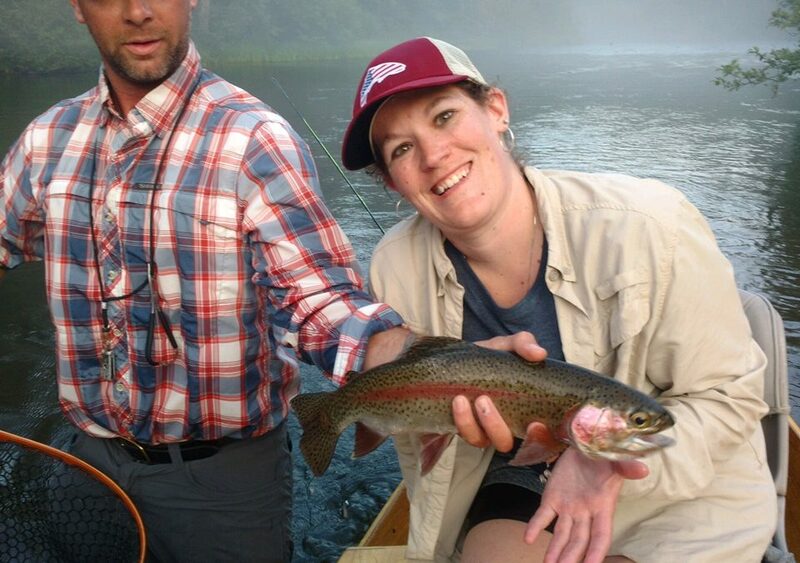 Your team of two will leave for the river at 8 pm when the horn blows, and can fish anywhere on the Au Sable and Manistee Rivers. Two flies per team. Some try hard, some try not at all. Prizes for first fish, best pic, and biggest fish. We use the honor system. We have fun. And we raise some serious money for the Headwaters Chapter of Trout Unlimited. If you haven’t done it, do it. If you have, re-do it.